Ministry of Propaganda - 17/May/2006: "International Phone Book Conspiracy?" Over in Germany Nico Lumma is wondering who is still using phone books in the Web 2.0 age, after all calls to directory inquiries are quite cheap now or you can just look numbers up on the web. Looking at the pile of phone books in the stairwell of my house I'm thinking the same. 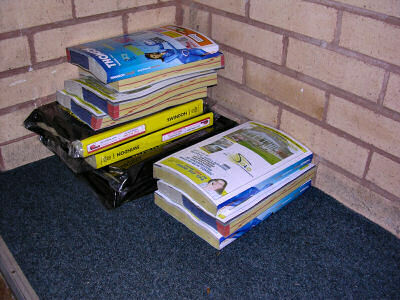 In particular why we get delivered three different phone books with more or less the same content? But then again, phone books are free compared to a phone call. If you know what you're looking for you're probably faster in a phone book than either calling directory inquiries or looking on the web. And there are still enough people who don't have a computer, let alone an always on broadband connection. Sometimes the phone books offer an additional value, like a free local map or a NHS - self-help guide. In other words, they still have a value. At the same time the stack of phone books has been sitting there for more than a week now, I suspect it will look similar in other houses. Broadband and free or ever cheaper calls are continuing to spread. So how long will the good old 'analog' phone book printed on lots of dead tree survive in the world of digital Web 3.0, 4.0, 5.0?